Click on the image of any card below to see enlarged versions and purchase options. Ontime Systems Limited have reluctAntly decided to withdraw from the supply of clock cards due to reduced order values and static stock. The illustrated cards below if not marked by OUT OF STOCK are still available. PLEASE CONTACT US FOR ADVICE AS TO WHERE TO OBTAIN CLOCK CARD USUALLY OBTAINED FROM US IN THE PAST. PRICE CHANGE - FedEx have now raised the prices for Easi-Pak consignments beyond an acceptable ratio of consignment cost to order value so orders will be sent by Hermes services on a 2-3 day delivery. NOTE - Customers using our Pro-Forma or 30-day account facilities will be invoiced at our standard list prices which reflect the manual cost and/or credit extended under these terms. Used with Needtek Range, Amano Range, Coper unit, Time- Precision Range, Iscus and many old clocks like Magneta, etc. Used with Amano Models 6800-6900 + 6700 ranges and Amano CP-3000. Also Iscus Pikkolo, Acroprint Lathem 8000 and other "Clipper" machines. Used with Amano CP-3200, Amano 8104 and Iscus 250Q "Hole Punch" machines. Also old ECS / Telephone Rental Lever & Autoprint machines. Used with some Seiko models like QR-900, Simplex 6000, ITR - 8600 / 8700 program lift machines the narrow version being sized for data processing. 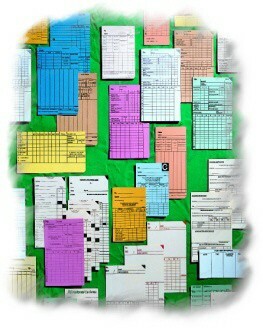 Monthly two sided cards used with Needtek UT-2000 time recorders & also substitute for TimeBoy clocks. Earlier TimeBoys may not work quite so well on these UK printed cards which are slightly thicker. Side Printing Job Cost and Attendance cards. Side printing cards are designed for use with clocks like the Seiko TP-10, TP-20, Simplex Patriot, Acroprint 125, Cincinnati 10,000 series, Lathem 2100, Lathem 4000 series and Simplex 'J' range. Also many older machines like ITR/IBM 2100-2500. 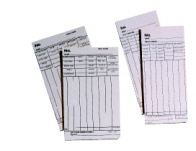 These cards come in several variants either Right or Left margin printing and versions exist with IN / OUT notations for 7-Day Attendance while ON / OFF versions serve for Job Costing. Encoded weekly cards for use with MAX range of Self Calculating Time Recorders. (Adjust order quantity in PayPal for number of 100-packs required. Also known as UK1 for Simplex time recorders not to be confused with English card styles 102115 or 2087. This is the American version of the six column card but with reduced bottom margin at 25mm. Click on picture for purchase options. Weekly card format for Needtek UT-2000 with 4-column IN / OUT and 7-rows for each day of the week.